Inspiring Ideas with artist Jeanne Winters: Mother's Day Giveaway! In honor of mothers everywhere, let's have a giveaway! One winner will receive all this: a pillow with felt and button flower accents that reads: "God made families for love, for laughter, for life. "; a photo vase that reads: "I have you in my heart. Phil. 1:7"; and a glass bowl and stand that reads: "Your love has given me great joy and encouragement." Visit Hallmark Gold Crown stores to see more of the Simply Inspiring gift collection! 3. For another entry. FOLLOW ME on blogger and don't forget to come back and let me know in a separate comment! Contest is open until midnight MT, April 26th. Winners must have a US address I can ship to. Leave your email or a way to contact you if you win! so cute, love the green! I would ♥ to win this for my mother! I follow Inspiring Ideas too! Ah, how cute! I love the green. That green is so fresh and Spring-y! I love this green! If I could afford it I would change my room decor to match! I follow you in my Google Reader. I love it! It would be a great mothers gift for my mom. This is her first MD since my brother passed away, and I think it would mean a lot! My chances of winning again are probably slim, but I just love all those items! So cute.....love that apple green! My mom would like this! I have been a follower for quite some time! I love this stuff and this would make a great gift for my mom! this is such a lovely spring gift! That is my favorite shade of green right now! Thank you for the chance to win. I have been folowing you for over almost two years thru email notifications and have used several of you ideas. I teach toddlers on Sunday mornings so for Easter, I made your cupcake toppers into stickers and put them on some little watering cans I got at walmart or $1.00 and gave them to the children. What fun gifts! My mother loves green these would work great for her! What a nice gift package! I would love to win! Thank you for the opportunity!! Oh, such adorable gifts! How I would love to win! Thanks for the chance! And I am a follower of your amazing blog! Adorable idea...my mother would love! What beautiful colors in this ensemble! Thanks for the chance. Adorable, thanks for the giveaway, beautiful things! I sure love you ideas!!! How cute! I love the pillow. Awesome! I would love to win this, they are beautiful! Thanks for the chance! I love the green. This is one Mama in need of a uplifting. Thanks for the inspiration. Would love this set. Thanks for thinking of us. i would love to win this for my mom. i just finished up with chemo treatments and my mom was at my side every step of the way, she is the best! Well, I never win...but I'll keep trying. Love your stuff! What great gifts! I receive your emails and enjoy the updates and your fun ideas. My friend and I do retreats and are going to do a craft retreat this October for Christmas Crafts. It is fun to see everyone's ideas, and it especially helps get the creative juices going. Hi, Stopping by from sits. You were the comment above me and thought I would stop by today! Hope you have a great day. I love your giveaway, very cute!!! Luv the colors. Visiting from SITS! Following you on Blogger - follow me? Would love to win. Thank you for the giveaway. I now follow your blog. Thanks again! 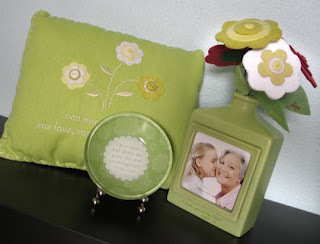 Love the pillow and vase! Beautiful. Thanks for the chance to win!